Home Fact-Check India Today connects a Facebook cleansing activity to Modi's "unpopularity"
Yesterday, India Today used amazing data mining and analytical skills to prove that Prime Minister Modi’s “popularity has taken a dip”. No, it did not conduct any internal survey or any opinion poll from their (and AAP’s) pollster Cicero. Instead they used “Facebook Likes” to reach to this conclusion. 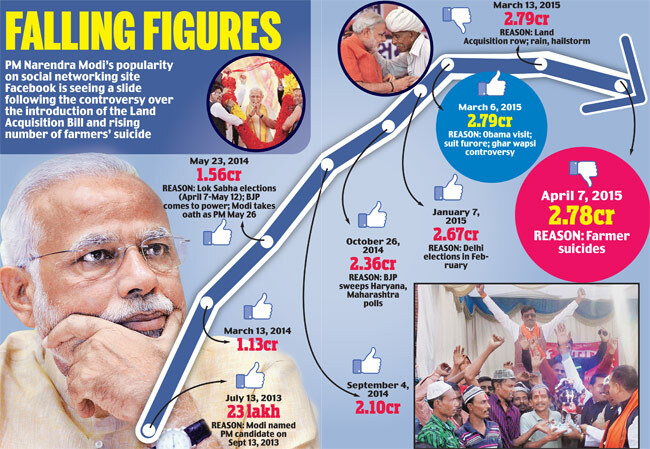 In both the graphs, there is a visible drop in number of ‘Likes’, which starts exactly around 13th-14th March. Could it be that Farmer’s and pro-farmer lobby unliked BhakSala’s Facebook page too? Or Is India Today building another false narrative? The answer is right in-front of you. If one looks at the note which appears above BhakSala’s graph, it shows Facebook clearly alerting users that “Pages may see decrease in likes after March 12” because they have “removed inactive accounts“. In fact, Facebook had released a detailed circular explaining this phenomenon, so that users aren’t alarmed at a sudden fall in likes. Ironically, India Today in the same article quotes Convenor of BJP’s national communication cell, who gives the exact same reason. But India Today, even though they were informed of this technical glitch, chose to correlate this fall in likes to Land Bill and other issues. This clearly indicates India Today had a narrative ready in mind, and just wanted some sort of “data” to back it, irrespective of how false that claim may be. In fact, if India Today had bothered to check their own Facebook likes, they would have seen a similar fall at the same time. But alas, Indian MSM doesnt believe in checking, especially India Today. In March, India Today lied that Sadhvi Prachi had said “Valdimir Putin’s original name is Vaarahmihir Putr Singh” and that Modi’s office is the top rejector of RTI queries. In February, they had misreported Minister Rajyavardhan Singh Rathore’s comments. And now, they have made up another story. Considering this shoddy, biased, agenda driven reporting, India Today’s Facebook likes should have plummeted even without Facebook removing inactive accounts. 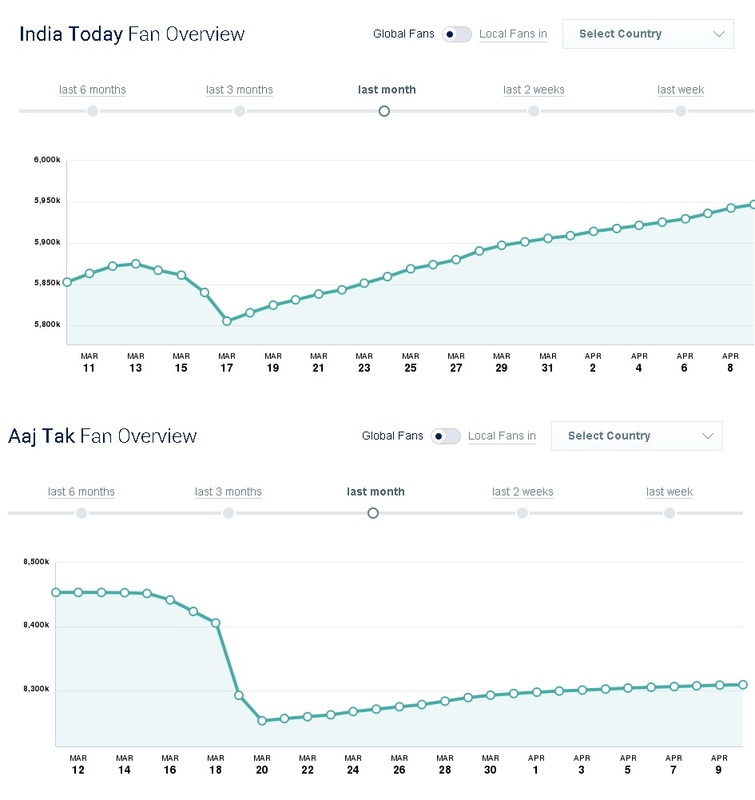 UPDATE: An alert reader showed us similar “Likes” graphs for India Today and Aaj Tak too. And unsurprisingly, both the accounts had lost “Likes” in the same time frame.